Electrical sockets can get damaged by being cracked or overheated. 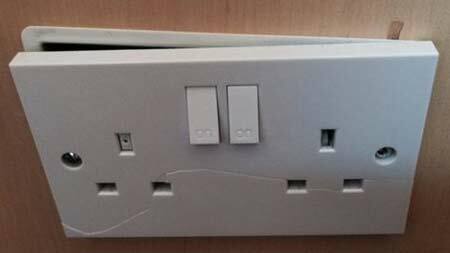 Don’t put off repairing damaged electrical sockets they are potentially lethal and it is not a difficult or expensive job to repair a damaged socket. Providing that you are competent you will have no problem repairing a damaged socket, it is a reasonably straightforward job. Please only complete electrical work if you are competent to do so see our electrical projects page including Part P of the building regulations for more information on electric competency. Please employ a professional qualified insured electrician if you have any doubts in your ability at any stage in the step by step guide below. 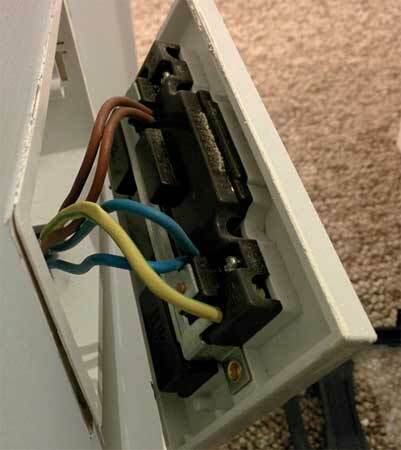 We are going to assume that the electrical socket outlet is connected to a standard ring main with no spur. You will, therefore have two cables in the socket outlet. If you are not sure whether this is what you are working on then please consult a professional electrician for advice (see above). 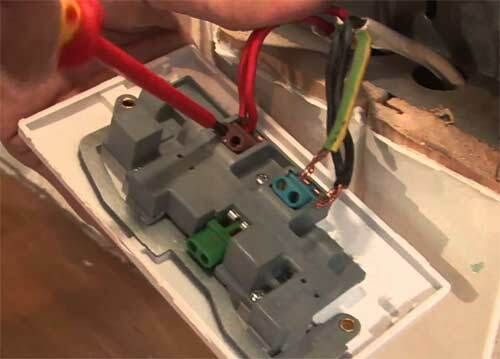 Before you do anyting, switch off the power at the mains consumer unit for the circuit concerned. You may be able to isolate the circuit by switching an MCB switch (see our fuses project for more information on circuit breakers). 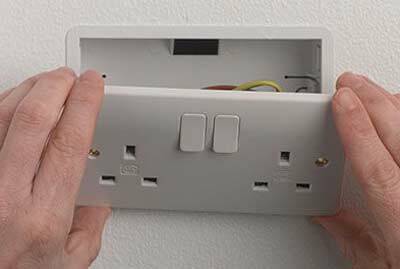 If you have removable fuses at your consumer unit, switch off the power at the consumer unit and remove the fuse for this circuit. You must be certain that the socket has been isolated from the power supply before proceeding so make sure you test it. It has been known for fuse boxes to be incorrectly labelled, so don’t take any chances. You can buy a tester very cheaply. Loosen the retaining screws on the faceplate of the socket in question. Put them to one side – making sure you don’t lose them. You can use masking tape to stick them to the skirting board below for safekeeping. Pull the socket outlet away from the socket box so that you can access the terminal connections on the back. Single or One pair of green and yellow (earth) conductors. If the socket outlet is mounted in a metal pattress box, you might also see an earth tail connecting from the earth terminal on the socket to the earth terminal on the back of the metal box. Using a small flat-head screwdriver undo each of the connection terminals at the top of the socket outlet so that you can release the conductors. Loosen the terminal connections on the new socket outlet (live, neutral and earth). Insert the live conductors into the hole in the live terminal marked ‘L’. This will be the brown or red cable. Make sure that there is no exposed wire showing, and don’t twist the wires together. Tighten the retaining screw to make sure the wires are firmly secured. Repeat step 7 for the neutral cable fixing them into the neutral terminal, marked ‘N’. This will be blue or black. Repeat step 7 for the earth conductors fixing them to the earth terminal marked with the earth symbol. These will be green/yellow. If you have an earth tail (see above) fitted between the socket outlet and metal patress box refit it when connecting the pair of earth conductors to the terminal marked with the earth symbol on the back of the socket outlet. One end should already be connected to the earth terminal on the back of the metal pattress box. 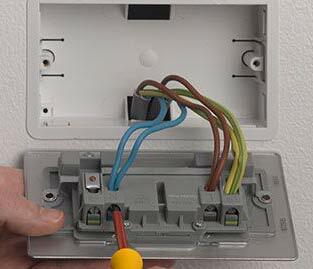 Make sure all your connections are made neatly into the correct terminals, with no stray wires and that they are securely fastened. Ease the face plate back against the back box. Make sure the cables are not kinked and are sitting neatly inside the box so they won’t get trapped when you screw on the face plate. Line up the face plate and use the retaining screws to fasten it in place. Making sure the face plate is level as you tighten up the screws. Place a spirit level on top as you tighten up the screws alternately if you don’t have a good ‘eye’ for checking the level. Restore the power and test that your new electrical socket works – we recommend plugging in that electric kettle and having a well deserved cuppa. Repairing a damaged electrical socket is a fairly easy task as long and you are careful and follow the steps outlined above. Above all, be careful and take your time. If you would like to know more about the electricity in your home and how it works, we have many electrical DIY projects in our projects section here. What Nutrients Should you use for a Healthy Lawn?